As you can see the library returns jQuery ajax promises, so we can use done() and error() callbacks to work with the server’s data. Today I want to speak about populating datagrid techniques with PHP. At least in my daily work datagrids and tabular data are very common, because of that I want to show two different techniques when populating datagrids with data from our database. Maybe it’s obvious, but I want to show the differences. Let’s start. Imagine we need to fetch data from our database and show it in a datagrid. Let’s do the traditional way. I haven’t use any framework for this example. Just old school spaghetti code. 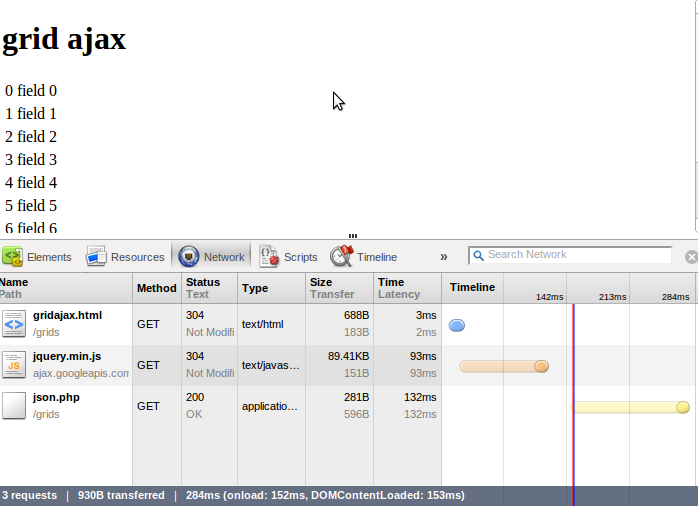 Even though the total time is better in the inline grid example: 156ms vs 248ms, 1 http request vs 3 HTTP request. 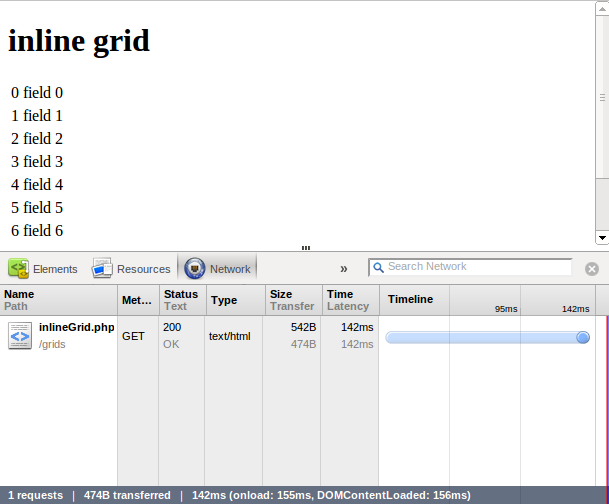 The user will see the page (without data) faster with the grid data example. What’s better. As always it depends on our needs. We need to balance and choose the one that fits with your requirements. Not all browsers support them. Not all proxy servers allows the communications with websokets. Because of that I prefer to use comet (at least now). It’s not as good as websockets but pretty straightforward ant it works (even on IE). Now I’m going to explain a little script that I’ve got to perform a comet communications, made with PHP. Probably it’s not a good idea to use it in a high traffic site, but it works like a charm in a small intranet. If you want to use comet in a high traffic site maybe you need have a look to Tornado, twisted, node.js or other comet dedicated servers. As you can see in my example I’ve created a personal protocol for the communications between the client (js at browser), and the server (PHP). It’s a simple one. If you’re looking for a “standard” protocol maybe you need have a look to bayeux protocol from Dojo people. 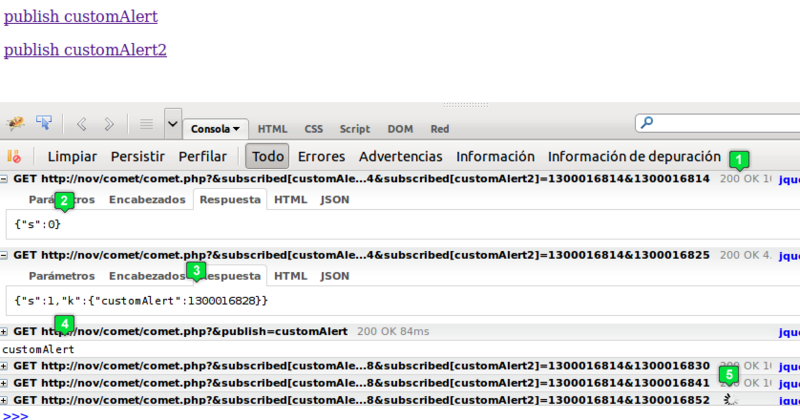 In the HTML page we start the listener (NovComet.subscribe). When we subscribe to one event we pass a callback function to be triggered. When we subscribe to the event, we pass the current timestamp to the server. Client side script (js with jquery) will call to server-side script (PHP) with the timestamp and will wait until server finish. client side script will repeat the process again and again. There’s something really important with this technique. Our server-side event check need to be as simpler as we can. We cannot execute a SQL query for example (our sysadmin will kill us if we do it). We need to bear in mind that this check will be performed again and again per user, because of that it must be as light as we can. In this example we are checking the last modification date of a file (filemtime). Another good solution is to use a memcached database and check a value. For the test I’ve also created a publishing script (NovComet.publish). This is the simple part. We only call a server-side script that touch the event file (changing the last modification date), triggering the event. And that’s all. Simple and useful. But remember, you must take care if you are using this solution within a high traffic site. What do you think? Do you use lazy comet with PHP in production servers or would you rather another solution? You can get the code at github here.